When you participate in our annual Pedaling for Payson cycling fundraiser you're making a difference in the lives of community members battling cancer, all while riding one of our scenic routes — ranging in miles — or our fun, adventurous mountain bike ride. 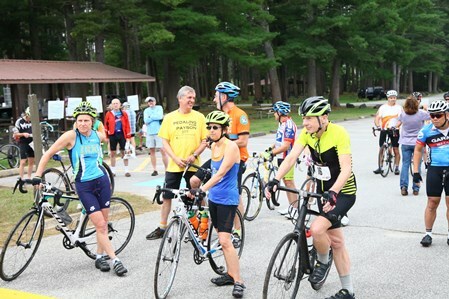 This special fundraising event is held annually at Elm Brook State Park in Hopkinton, NH. The event is September 14, 2019. Your registration fee, or charitable gift to this event, supports the Pedaling for Hope Fund at Concord Hospital Payson Center for Cancer Care. The Fund largely underwrites the Center's Nurse Navigator Program, which serves to coordinate both the medical treatment and community outreach for the most vulnerable cancer patients. In 2018, the event raised more than $157,655 to provide cancer patients with much needed guidance and out-of-pocket expenses assocated with their cancer treatment including gas and grocery cards. Choose from four scenic routes —16 miles, 30 miles, 51 miles or 77 miles. Back by popular demand is a fun, adventurous mountain bike ride that includes a rest stop at Henniker Brewing Company. After your ride enjoy delicious BBQ and live music. Buy raffle tickets for the chance to win a FX road bike donated by S&W Sports and valued at $600. Joining us on Facebook ~ Like and follow Concord Hospital's Facebook page to receive the latest information about this event. Comment, like and share our posts with your Facebook network and help us reach others with our mission. When you become an event sponsor your company’s brand is exposed to 300+ cause-orientated community members attending the event. 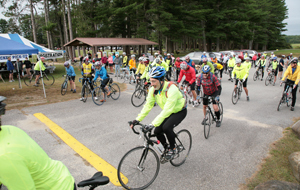 Call (603) 227-7162 to invest in Pedaling for Payson sponsorship opportunities. To meet your specific sponsorship investment goals, you can choose from sponsorship levels ranging from $100 to $10,000, while helping to fund Payson Center for Cancer Care patients with out-of-pocket expenses associated with their cancer treatment.